What the Hell Will Happen Now? An Angel Day is a day when you are supposed to spend your time selling your labour power to profit someone else, but instead you spend your time creatively, thus profiting yourself. If you call in sick to work and spend the day watching telly - that's a sickie. If you call in sick to work and spend the day writing, painting or playing music - that's an Angel Day. The phrase was coined by my old pal and former bandmate Giles back when he was working a soulless IT job. He left the job and the county of Dorset sometime just after the Millennium. Thanks to a reconnection via Facebook, I see he is now the vocalist for a psy-dub reggae band called dubblecross. Check them out! At the end of the 1990s, Giles and I were in a band called Land. (We were originally called Bond, but then a string quartet stole our name and went on to sell 4 million albums - don't bother to check them out.) The other members of the band were Jonnyboy on drums, Chloe on vocals and Bob the Bassist. This line-up played precisely one gig of four songs at the Brewer's Arms in the Spring of 1999. It was the leaving party for the pub's landlord and landlady who were moving back to Ireland. I helped them move, but hadn't planned on how to get home so wound up working in a pottery factory in Ireland for six months. 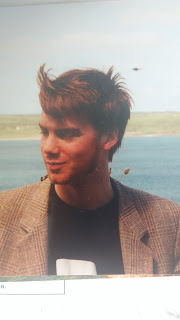 Me in Ireland, summer of 1999 - I still have that Guinness T-shirt. I have no idea what happened to the tweed jacket. Upon my return, I discovered that Land had called in my mate Alex to play guitar in my place. In fairness, this was a good call. Alex can actually play the guitar properly. He knows scales and can figure out how to play a song by listening to it! I jammed with them a couple of times, but ultimately felt my place was better suited to propping up the bar at their gigs (or roadying as I liked to call it). And so my career as a rock and roll star came to an end. I don't play music as often as I used to, which is what makes Angel Days all the more important.